Cast of a Lowe point from the Lowe Ranch in Belize. This is an excellent example of a Lowe point. It was found on the type site location in northern Belize on the Lowe Ranch, where the name for this point was borrowed. 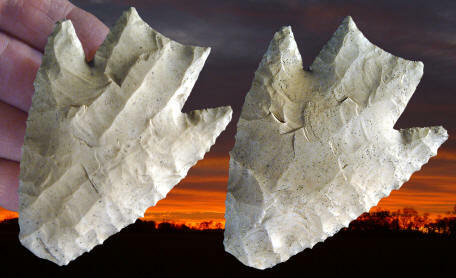 The Lowe point type and this point were first illustrated and described in Kelly's report on "Preceramic Projectile Point Typology In Belize." The sharply defined barbs, very large parallel sided stem, and the long narrow flake removals from the blade edge and base of the stem are some of this points most noticeable features. "Classic" examples of Lowe points have sharply defined, massive and widely angled barbs. The stems are ground on the edges and the stems also tend to be very large and parallel sided and straight to concave on the basal ends. The cutting edges are beveled from resharpening and often sharp and serrated. Some examples were resharpened with parallel oblique flaking. Their most interesting diagnostic trait are end thinning flake removals. The stems are thinned from the base in a way that Kelly (1993) described as "flake scars that are indistinguishable from flute scars." Lowe points are massive heavy duty beveled points that some suggest were probably only used as knives. But it's very likely they were used for both projectiles and knives. Many of them do have point impact damage. This point is heavily patinated and is most probably made of Colha chert. It measures 3 1/16 inches (7.7 cm) long and 2 1/4 inches (5.7 cm) wide. The most recently reported age range for Lowe points is mainly based on two radio carbon dates that were taken from the Ladyville site and the Pulltrouser site. Both sites are in northern Belize. The Ladyville charcoal sample came from an exposed hearth where two in situ Lowe points were found within a 5 meter radius of the sample. Another charcoal sample was taken from the Pulltrouser site where another Lowe point was found nearby. The average of the radiocarbon dates suggests that Lowe points date somewhere between 4,500 and 3,900 years before present.